Trappro humanely removes opossum that have gained access to your attic, walls, shed or other areas of your home. If you hear noises in the attic or sounds in the walls of your house call us today. Opossum will be trapped and removed. Opossum nests, droppings and other messes made by opossum will be safely removed from walls, attics, roofs, chimneys, sheds etc. Dead opossum or baby opossum will also be carefully removed if found in your home in Maryland, Washington DC or Northern Virginia. Description: Opossums tend to look somewhat like a giant rat. They have long pointed snouts and skinny naked tails. Opossums have the most teeth of any mammal (50), opposable thumbs, gray fur on the main body, 4 legs, and their skinny naked tail is prehensile (can wrap around tree limbs and such for short term suspension). They average out to be approximately the size of a large house cat; approximately 10 to 14 pounds. Opossums are North America's only marsupial, meaning they raise their young in a pouch (like kangaroo's). Opossums are nocturnal animals and are rarely seen in the daylight hours. Opossums are excellent climbers, spending much of their time in above ground areas. Their sharp claws and prehensile tail aid in their search of altitude. While they are not very fast animals, they will stand their ground when being threatened by bearing their teeth. In dire circumstances, they are known for playing dead. They will fall over and, surprisingly enough, doing so works as an excellent mechanism against predators or danger. Opossums CAN be aggressive if need be. Hissing or squawking noises are common. Food Sources: Opossums are among the scavengers when it comes to their eating habits. Carrion (road kill) is a favorite of theirs. Many opossums are killed each year by hunting for carrion on the busy roads. Given that they are omnivores, when carrion cannot be found, garbage or just about anything will do. Meat and rotting carcasses still remain their favored meal. Life Span & Reproduction: Opossums typically begin mating from December to January. After fertilization from a male opossum, usually much larger and heavier than the female, gestation is only a short 12 to 15 day process. Once the 7 to 8+ young exit the uterus, they must make their way to the mother opossum's pouch and search for a teat to clasp on to. There are usually 13 teats on any given female and, at times, some of the young may fail to live, due to the short supply of teats. Opossum females can have up to 25 young at a time. The young who survive the trip to the pouch and the search for a teat will live in the pouch for about 55 days before exiting. Upon exit, the young spend about 4 weeks on the mother opossum's back. Independence will set in after those last few weeks on mom's back. Opossums have no specific breeding season, but may have up to 3 litters each year. They have a rather short life span, about 2 or so years, due to their hunting strategies. Typical Areas of Entry: Opossums are more so common in urban areas than wild areas. Opossums are nomadic and opportunistic animals. They wander about, but do choose to live in 1 place for a substantial amount of time often. Typically, invasion occurs when a female with young is attempting to establish a home base. Ground level openings are the main concern, but they do have climbing abilities. They are known to find their way into attics and walls that allow them climbing room. Opossums are partial to entering, but are not limited to entry through: unscreened ground level crawlspaces/vents, open or damaged crawlspace doors, under sheds and hot tubs, and even directly beneath the foundation. Opossums will be urinating and defecating in the areas that they habituate. The insulation become soiled and an odor is likely to be profound due to the excrement/debris. The "R" value, which dictates thermal resistance, will become declined over time as the squirrels push down the insulation little by little. Their continuous running, even without debris left behind, can destroy and make insulation useless. Trappro offers attic insulation/debris removal along with re-insulation services. Typical Treatment: First, a thorough inspection by a Trappro technician will be completed. At that time, the area(s) of entry will be identified and trapping/removal will commence. Trapping lasts for approximately 3 to 5 business days to work as our first line of defense. Live cage traps will be set near/on the entry/access points. The open areas where the opossum(s) have gained entry will be monitored for activity during the duration of the trapping service. 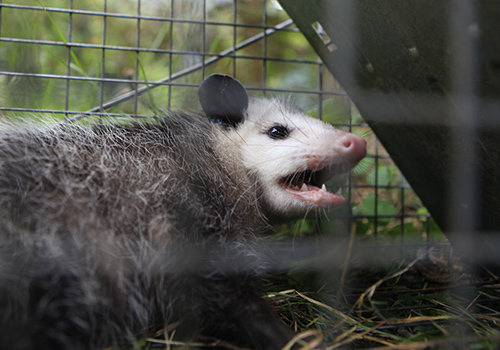 The technician will place a breakable barrier/screen/tape (whatever is available) over/inside the holes or entry points to monitor the opossum(s) movements in/ out of the open areas. This technique allows us to record wildlife movement and will assist in dictating the duration of the trapping service. Once a point of no activity has been reached, Trappro will feel comfortable removing the live traps and installing temporary screenings over the existing entry points. The trapping/removal service, along with our patch, is guaranteed against animal re-entry for 30 days. Trappro recommends permanently sealing the opossum(s) area(s) of entry. Upon the inspection, a proposal will be provided for permanent repairs to the home or structure. Trappro completes and warranties permanent repairs against wild life re-entry for up to 10 years. If opossums are simply inhabiting or invading the yard with no specific point of entry, Trappro offers an open area trapping service for these purposes. Open area trapping is difficult simply because Trappro cannot force animals in to a trap. The exterior of the home is their natural habitat. Opossums can only be baited to then further lead themselves inside before we are able to remove them from any property. Open area trapping services last for a total of 7 business days and hold no guarantee. Any animals/wildlife lead inside our traps will be removed. Trappro does not charge per animal or per trap. Dangers: The number one concern when dealing with an opossum intrusion is the rate of transmitted rabies disease to these creatures. Rabies is the most highly transmitted disease with this type of wild life as with all mammals; it can be easily transferred to humans and other animals with direct fluid contact (bite, scratch, etc.) NEVER approach an opossum that is discolored, looks/acts sick or confused, is hunched over, or appears to be lacking nutrients. Domestic animals should be vaccinated and kept away from these creatures, as well. Opossum excrement/droppings can also contain dangers such as roundworms, tapeworms, salmonella, leptospirosis, and various other parasites that are easily transferred to humans or pets. Our professional trappers will also be able to seal up holes in attic or walls including fireplaces and vents where opossum have entered the home. Trapping and exclusion of opossum is available for homeowners and business owners throughout Maryland, Washington DC and Northern Virginia. Call Trappro TODAY! Have your opossum intrusion on the road to resolution!